Soledad Torres Acosta was a woman who was completely open to the action of the Holy Spirit. She knew how to see the hand of God in everything that happened around her. She let herself be seduced by His loving and irresistible call that invited her to follow Him. She welcomed Christ into her heart, and her life was transformed into a gift for others. In humility and with God as her sole support, she even dared to undertake a great work in the Church: The Institute of the Servants of Mary. Saint María Soledad was born on December 2, 1826, in Madrid, Spain. She was the second child of Francisco Torres and Antonia Acosta. She was baptized two days later and was given the name Antonia Bibiana Manuela. Her childhood and youth passed by in the simplicity of daily life like any other young girl of her time; however, her love for the Blessed Virgin Mary and for prayer already stood out in her. When she was 25 years old, she heard the Lord’s call and asked to be admitted into the new Institute of the Servants of Mary that Father Michael Martínez, the parish priest of the neighborhood of Chamberí, had set out to begin for the purpose of caring for the sick in their own homes. The foundation took place on August 15, 1851. 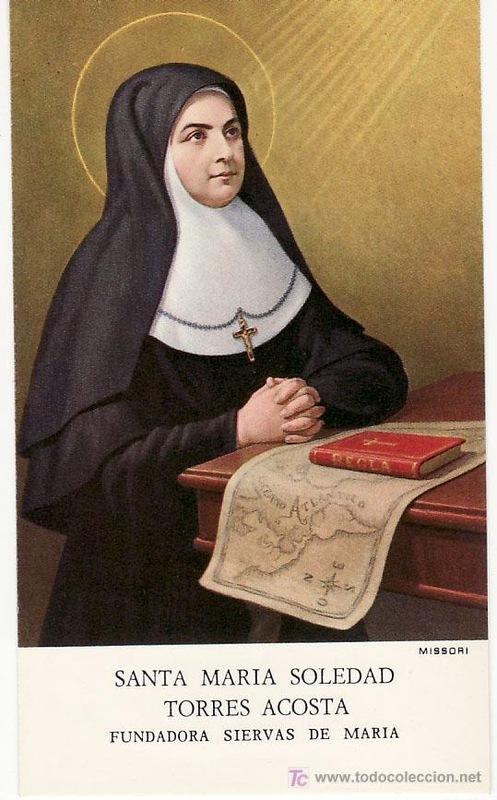 Manuela, who from then on would be called Sister María Soledad, would be the seventh of the founding group. This is how Mother Soledad began her long journey through inspirations and darkness as she placed herself at the service of the poorest of the poor–the sick- seeing in them Christ Himself. With the total gift of herself, she went about showering the most exquisite and diligent charity upon the sick and poor. With profound humility and her great capacity to love, she understood the richness that the poor and sick possessed: they were nothing less than Christ Himself, the Divine Patient. It was Him for whom she kept vigil at night. She would look at Him, talk to Him, love Him and cure His wounds and kiss them… and the encounter was transformed into trust, hope and salvation. In this way she collaborated in the building up of the Kingdom of God. After five years of complete dedication to the care of the sick, she saw that it was necessary for her to accept the position of General Superior. When Father Michael departed for the missions, she took charge of the Congregation, trusting in Divine Providence, and became the Foundress and Mother of the Servants of Mary. Day after day, Mother Soledad did everything possible to provide for her Daughters’ spiritual wellbeing; her entire person reflected the gratuitousness and goodness of God. Her meek and humble heart was empty of herself and open to all; there were no limits of any kind for she knew that she belonged exclusively to God, and she gave her life as a free gift without receiving anything in return. Open and willing to carry out the divine will, she had a deep sense of God’s presence within her. She constantly lived in the presence of God in everything she did: her work, various circumstances, unexpected events, the most ordinary tasks. She discovered God in everything because her heart was immersed in Him. She solved everything with the logic of love based on humility, charity and gratitude. Because she lived poverty to the extreme and because she was profoundly humble, she acquired the liberty of spirit to be equable and magnanimous toward all, making herself the smallest and least of all. Her secret was simple: seek the will of God always and in everything: in her many hours of prayer, in her personal encounter with God’s providence, in her friendship with Christ in the Holy Spirit whose growing presence she perceived in her soul as it became more transparent and penetrating every day, impelling her to work in her preferred and beloved field: the sick. Her goal was clear: to be transformed into another Christ. From the very beginning, a clear sign of this transformation was her love for all, especially the most abandoned of society: those with contagious diseases. “The poor are my brothers”, she would say. She was so generous in sharing the little she had that all who came to her were surprised by this small woman with such a great soul. By her presence or her smile or by giving away a piece of bread, she revealed that God dwelled within her and that God is Love. Mother Soledad showed us that the most wonderful gift from God is to be able to be fully identified with Christ who was obedient unto death on the cross. She experienced the emptiness, the loneliness and the abandonment of many, but never did she lack trust in Him who can do all things. She knew that the Cross of Christ is the source of strength and joy and that there are crosses that renew the life of the Church. She would exclaim, “May I know how to suffer”. “Give me light and grace to be able to suffer and endure more for You” (Letter 75). For her Daughters she prayed for “the grace to follow Him unto Calvary and to die crucified for love of Him” (Letter 75). Mother Soledad took upon herself the suffering of the sick, of all of her Daughters, of the Church and of the entire world. She completed in her own body what was lacking in the passion of Christ, and her love and union with the Crucified Christ reached its fullness when she no longer desired anything else for herself or for her Daughters other than to “love the cross of Christ and not desire anything else” (Letter 63). This is the logic of love. Mother Soledad relied on an exceptional woman for support and assistance who was her Mother on her journey: Our Lady, Health of the Sick. She was her model who she called her Mother, her consolation and her joy. Like Mary, she also gave her unconditional yes to the will of God and allowed herself to be molded in the forge of divine love. She was a bearer of Christ as she cared for the sick and proclaimed the Good News by her words and actions. She anticipated the needs of others in a motherly spirit of service to all. Like Mary she was at the foot of the Cross as she stayed at the bedside of suffering in an attitude of salvific offering. She was able to read history in the light of faith and hoped against all hope. “I have placed my confidence in Mary”, she would often repeat as she placed the “little boat” of the Congregation in her hands so she could lead it safely home. Full of gratitude and abandoned into the hands of the Father, she left this earthly life on October 11, 1887, a nine o’clock in the morning. She died like a grain of wheat as she reached the fullness of love. She left the “tree” of the Congregation flourishing with 46 foundations in Spain and overseas. Our own spirituality: Contemplatives in action, abandoned to Divine Providence, collaborators with Christ and Mary in the salvation of mankind. Specific charism: the diligent and gratuitous care of the sick, preferably in their own home. Her message: May you have peace and union and keep the Rule of Institute.